Pictured below is a controller we recently made for a solar water heating system including a full datalogger. 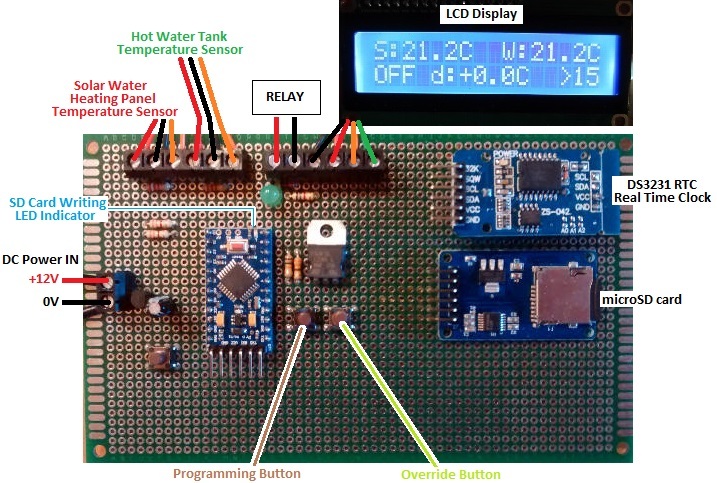 This controller is based closely around our 2016 Solar Water Heating Pump Controller which already has basic datalogging functionality – minimum, maximum, and average temperature sensor readings displayed on the LCD. To this we have added a micro SD card reader and a high accuracy DS3231 Real Time Clock (RTC). 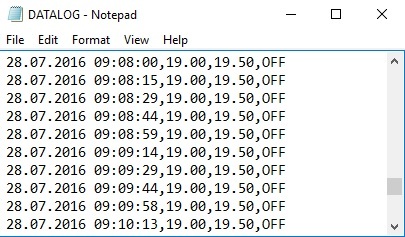 Every 15 seconds, the temperature of each of the sensors, the status of the controller, and the date and time are appended to a logging text file on the micro SD card. The collected data can then be copied over from the SD card to a computer for detailed analysis, graph plotting, and so on. This controller is based around an Arduino Pro Mini coupled with an LCD module, DS3231 RTC module, micro SD card module, and DS18B20 temperature sensors – all of which are readily available and economically priced. The only difficulties with this project came from the limitations of having only 32KB of flash memory (program space) on the Arduino Pro Mini – not a lot when including so many code libraries for the various modules and sensors as well as 750 lines of of project specific code for this complex datalogging controller. If you need any kind of datalogger, please email neil@reuk.co.uk with details of your exact requirements.